Music history was made as Hip Hop greats Common, Q-Tip & KRS One rocked the Element Nightclub last night. The incredible show not only included selections from their endless array of hits, but the premiering of 3 new remixed tracks. 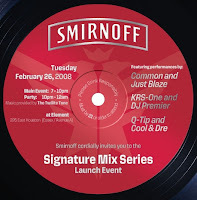 Commissioned by Smirnoff to remake their iconic songs, the MCs were paired with current heavyweights Just Blaze, Cool & Dre, and DJ Premier who were also in attendance. No. 1 or No. 2?